The 17th-century Japanese Pagoda with some BYO lighting. It's another very nice morning down at the Tidal Basin. A bit warmer than it has been lately, and still. And, once again, there was a big turnout for the sunrise. The cherry blossoms are still looking great, and while some of them are starting to look a bit fragile, very few petals have been blown off so far. After another pleasant day today, rain is expected tomorrow. That's not helpful, but with luck the cherry blossoms will still be looking beautiful afterwards even if they lose some petals in the rain. Reader photo submissions will be opening soon. You can find details on that below, along with more information and photos from this morning. But first, a call for help, please. 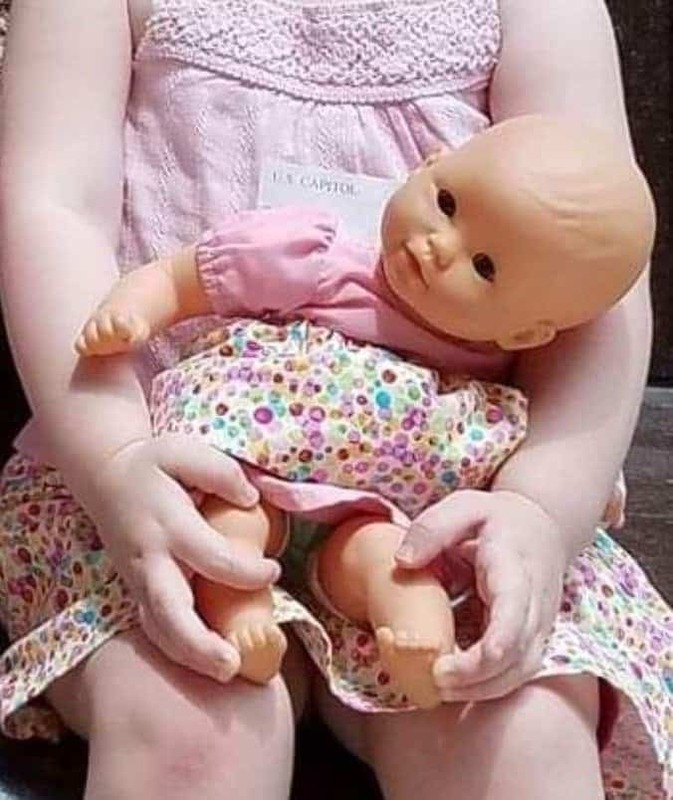 If you were at the Tidal Basin yesterday afternoon and came across a doll that looks like this, please get in touch with me. It was dropped near the Jefferson Memorial around 4:30pm. It's the special friend of a young girl who was visiting the cherry blossoms with her family, and it has special significance not just to her but to her family. She is understandably very upset. So if you saw it or handed it in to a NPS staff member, please let me know and I'll put you in touch with the owner's family. And another reader found a male wedding band near the Washington Monument yesterday. Get in touch if you lost one and I'll put you in contact with the finder. Each year for the past few years I've posted a selection of the wonderful photos that Cherry Blossom Watch readers have sent in. You can see the first installment from last year here. I'm not quite ready to take submissions, but I'll be posting the submission form sometime soon--so stay tuned and get your best shots ready! Since then, the weather has been favorable for keeping the blossoms out--cool, calm, and mostly dry--and they've been going strong. It should be a bit warmer today, and then rain is expected tomorrow. The threat of thunderstorms over the weekend seems to have backed off until early next week. Now that the blossoms are starting to get more fragile, rain and wind isn't helpful. It's impossible to say for sure what effect it will have--or even if the weather pans out as forecast, for that matter--so we'll just have to wait and see. They might get through it relatively unscathed and still looking great, but with this kind of weather at this point of the bloom, it's always a bit risky. It's on its last legs now and about to leaf out. I checked in on some of them yesterday. You can find the photos at the bottom of the post here. Just posted some photos taken early this morning in the rain here.